Prime Minister David Cameron called a meeting of the United Kingdom’s emergency co-ordination group (COBR) today after a man believed to be a British soldier reportedly was hacked to death on a public street near a military barracks. 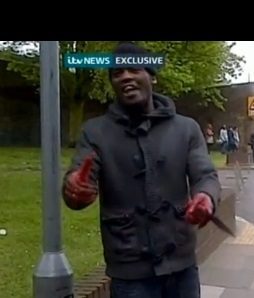 A video from ITV News has emerged of a man holding a bloodied meat cleaver and apparently taking credit for the attack. At approx [2:20] pm (local time) we were called to reports of an assault in John Wilson Street, Woolwich where one man was being assaulted by two other men. A number of weapons were reportedly being used in the attack, and this included reports of a firearm. Officers including local Greenwich officers arrived at the scene. Shortly afterwards firearms officers arrived at the scene. On their arrival at the scene they found a man, who was later pronounced dead. At this early stage I am unable to provide any further information about the man who has died. Two men, who we believe from early reports to have been carrying weapons, were shot by police. They were taken to separate London hospitals; they are receiving treatment for their injuries. I can understand that this incident will cause community concerns, and I would like to reiterate that we are investigating what has taken place today. The MPS will investigate the circumstances that led a man to lose his life and the IPCC, as is routine, will investigate the circumstances in which police discharged their weapons. There will continue to be an increased police presence in this area, and the surrounding areas this evening. That presence will continue as long as is needed. I am asking people to remain calm, and avoid unnecessary speculation. I will update you again as soon as I am in a position to do so.